As I mentioned in a previous blog post on my most favourite life changing books, of 2016, the book that started off my year was Hal Elrod’s Morning Miracle. In that blog post I told you I would share with you my morning routine. It is similar to Hal Elrod’s, but deviates from it slightly too. While my kettle is boiling I drink a whole glass of water and take a probiotic. Because I suffer from migraines, I then wear my Cefaly for 30 minutes each day (link) . I wear this while I sit in front of my altar, journal and do my daily draw from an oracle or tarot deck. The journaling is quite involved and lengthy. At the end of the journaling I visualize what would enrich my day. Once I have journaled then I do my yoga practice which usually includes some connective tissue rehydration. After yoga, I do shamata meditation for 24 minutes. This is a style that I learned from my teacher, Carly Forest. Shamata is a mindfulness based meditation, the intention is concentration and focus on breath in your belly, drawing attention away from thought. Shamata which translates as calm abiding is said to steady and concentrate your mind. At that time, usually about an hour and a half has passed and it is time for me to get my daughter up and off to school. My daughter and I have breakfast together and after she leaves for school I spend another half hour doing some reading either for personal development or to help me develop my teaching skills. At around 9 am I turn on my computer and then begin my day with the most high brain power, creative projects. I would love to hear from you! What is your morning routine? 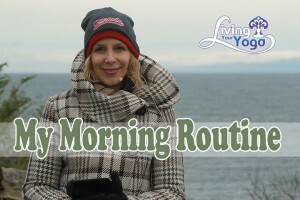 If you would like a detailed outline of my morning routine that you can follow along at home then click below.